How do I know if I lack wisdom? 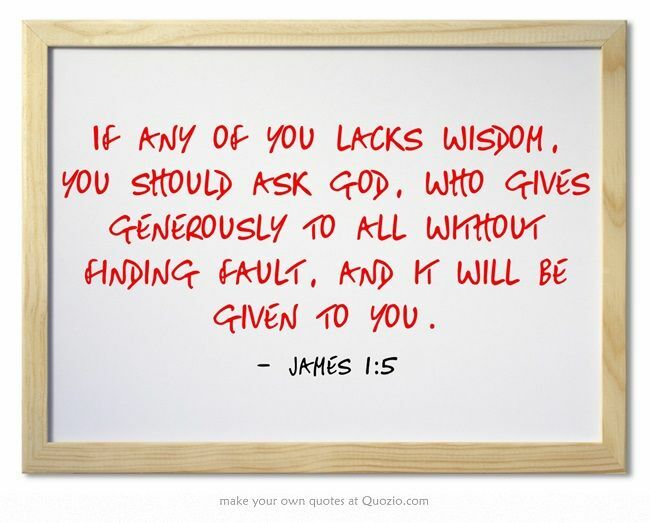 The book of James 1 verse 5 says; “If any of you lacks wisdom, let him ask of God, who gives to all liberally and without reproach, and it will be given to him.” This book is not usually deemed as the ‘wisdom’ book but this verse speaks on wisdom and emphasizes it’s importance. The wisdom being talked about is Godly wisdom, often referred to as ‘ divine wisdom’ so I can’t judge by what my mind is naturally conditioned to think or what the general consensus is, there is a much deeper dimension. This, therefore, suggests that there are at least two kinds of wisdom; divine wisdom and worldly wisdom. ‎Divine wisdom is the ultimate goal at all times but how do I know which kind of wisdom I am operating under? In any given situation or moment, we can take the litmus test and ask active questions like; does it line up with the word of God? Is the wisdom I think I posses one that seeks to diminishes others, one set out to please others at the expense of God’s command and so on. It would be ‎optimum to live from a place of constant divine wisdom where our request from God is for more and more wisdom. As the saying goes, we should ‘grow older and wiser’ but I have found that this can only be attained from a relationship with the Holy Spirit where he is our constant guide to life, there is no corner to be cut in this. Another gem found in this verse (James 1:5) is that it gives an assurance that we can and should ask God for whatever we are lacking. It is stated like a no-brainer, ‘if you are lacking, ask!’ there is no ounce of hesitation or drawn out pondering in the way this is expressed. James 1:6 goes on further to say we must ask in faith‎, without wavering; “But when you ask, you must believe and not doubt, because the one who doubts is like a wave of the sea, blown and tossed by the wind.‎”‎ There is a certainty about asking in faith without doubting as it is impossible to please God without it (Hebrews‎ 11:6). It brings to light that if we ask God for anything in faith, we will receive it. ‎I pray that you may grow in both wisdom and unshakeable faith daily. Remember, if you are lacking anything, ask of the Lord.